Well, tomorrow starts a month of major transitions as the actual relocation from England to the US looms large. I know for sure I will not have internet access for at least a week during August, and am not certain how much time or energy I’ll have on the days when I do have a connection, so I wanted to be sure I ended July with a plan to keep posting every day. 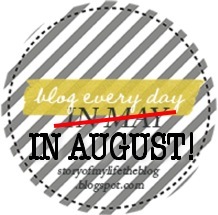 Thanks to WordPress’ feature that allows me to draft and schedule posts in advance, and a 31-day daily blogging challenge originally hosted in May by Jenni on Story of My Life, I’ve got August covered. I hope that I can find some time to throw in some fiction and/or photography posts during the month, but I don’t want to make promises I can’t keep, so we’ll all just have to wait and see what happens. Day 6: If you couldn’t answer with your job, how would you answer the question, ‘what do you do’? Day 10: Most embarrassing moment(s). Spill. Day 21: A list of links to your favorite posts in your archives. Day 26: Something you read online. Leave a link and discuss, if you’d like.